Provide comfort for the family of Alexandria Farris with a meaningful gesture of sympathy. 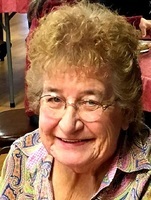 Alexandria "Sandy" June Farris (Roth) went to her Lord and savior peacefully at her home on March 25, 2019. Sandy was born June 3, 1938 to Elizabeth and David Roth of Park City. She was the third of four children. Sandy was raised on their family farm with her siblings Charles, Susie, and Norma. She went on to graduate from Park City High School. In 1960, Sandy married Herschell Farris. From that union they had two children Timothy and Starla Farris. While living in Joliet, Sandy and Herschell owned and operated The Log Cabin Cafe. She worked for AT&T as a telephone operator for many years, until she retired in 1997. Shortly after retiring from the phone company, Sandy started working for First Student as a bus driver, which she continued to do until 2013. She enjoyed the people she worked with there, and interacting with the kids that rode her bus. On many occasions, she would get to work early or stay late to play yahtzee or pinochle with her co-workers and friends. Sandy was an avid church goer. She had been a part of New Life Church in Billings for over thirty years. Sandy loved church, and looked forward to seeing her friends there every Sunday. She enjoyed when her family would join her at services. Sandy always made sure her grandchildren were involved in church, that they attended vacation bible school, and went to church camp. In her spare time Sandy enjoyed baking cookies (that she would take to the bus barn), watching "soaps" (soap opera shows), and making blankets for her grandchildren, great-grandchildren, and friends. Sandy also loved her dog Max, who her grandson has graciously adopted. Sandy is preceded in death by her mother Elizabeth, father David, brother Charles, sister Susie, and granddaughter Cierra Farris. Funeral service will be held at New Life Church in Billings on Monday, April 1 at 10 a.m. If you are unable to make it to the funeral service, there will be a viewing available at Smith Funeral Chapel on S.27th St on March 31st from 12p-8p. To plant a memorial tree in honor of Alexandria June "Sandy" Farris (Roth), please visit our Heartfelt Sympathies Store. We encourage you to share your most beloved memories of Alexandria here, so that the family and other loved ones can always see it. You can upload cherished photographs, or share your favorite stories, and can even comment on those shared by others. May the family of Alexanndria June Farris please accept my sincere condolences hoping you find comfort in God's words at Acts 24 : 15 and Psalm 37 : 29.